To gain an understanding of methods of measuring entropy and entropy change. Using this as a reference point, the entropy of a substance can be obtained by measuring the heat required to raise the temperature a given amount, using a reversible process. Reversible heating requires very slow and very small increases in heat. Determine the change in entropy (in J/K) of water when 425 kJ of heat is applied to it at 50oC. Assume the change is reversible and the temperature remains constant. Larger, more complex molecules have higher standard molar enthalpy values than smaller or simpler molecules. There are more possible arrangements of atoms in space for larger, more complex molecules, increasing the number of possible microstates. 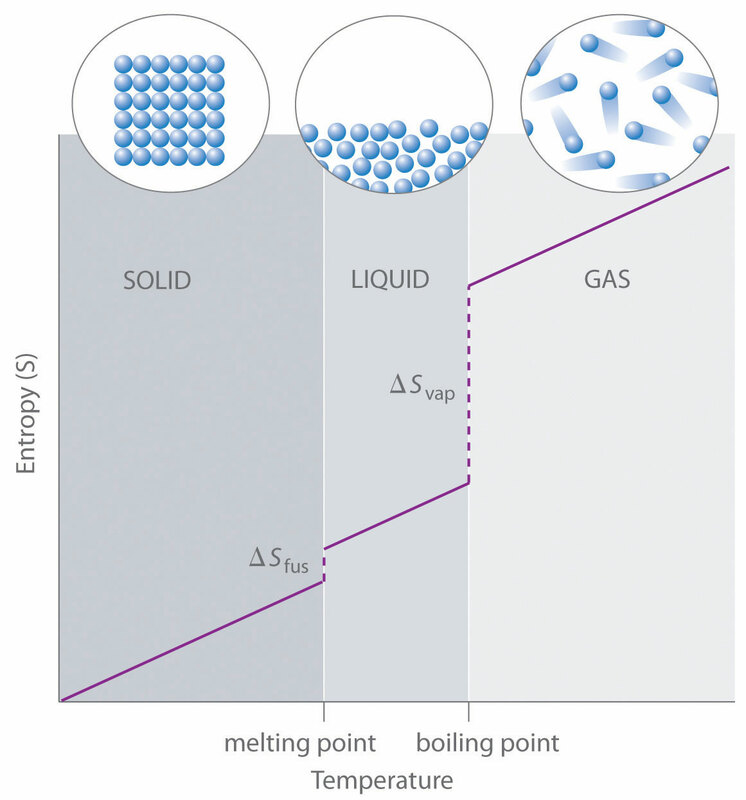 Gases tend to have much larger standard molar enthalpies than liquids, and liquids tend to have larger values than solids, when comparing the same or similar substances. The standard molar entropy of any substance increases as the temperature increases. This can be seen in Figure 18.3 “Entropy vs. Temperature of a Single Substance.” Large jumps in entropy occur at the phase changes: solid to liquid and liquid to gas. These large increases occur due to sudden increased molecular mobility and larger available volumes associated with the phase changes. This is a generalized plot of entropy versus temperature for a single substance. where n and m are the coefficients found in the balanced chemical equation of the reaction. The second law of thermodynamics states that a spontaneous reaction will result in an increase of entropy in the universe. The universe comprises both the system being examined and its surroundings. For the previous example, the change in the standard entropy, ΔS⁰, for the synthesis of carbon dioxide from graphite and oxygen, use the previously calculated ΔS⁰sys and standard enthalpy of formation values to determine S⁰surr and ΔS⁰universe. At absolute zero (0 K), the entropy of a pure, perfect crystal is zero. The entropy of a substance can be obtained by measuring the heat required to raise the temperature a given amount, using a reversible process. The standard molar entropy, So, is the entropy of 1 mole of a substance in its standard state, at 1 atm of pressure. Measuring Entropy and Entropy Changes by Jessie A. Key is licensed under a Creative Commons Attribution 4.0 International License, except where otherwise noted.